The Bayswater ladies continued on their winning run with a 3-0 win away to Subiaco under gloomy conditions at Rosalie Park on Sunday afternoon. Bayswater started the game slowly missing countless opportunities, but managed to score late in first half thought a nice counter attack down the right hand side by vice captain Amy Cameron whose cross was too powerful for the Subiaco goalkeeper to hold, and midfielder Melissa Pellicciotti took the opportunity to pounce onto the dropped ball and strike it into the back of the net. The goal celebration cartwheel needed some work however The goal was her first goal in Bayswater colours. however The goal celebration cartwheel needed some work. The visitors doubled their lead through Laura Darrie who ran onto the ball and dribbled around the Subiaco keeper who made a lunge for the ball but missed it and Darrie was able slotted the ball into the empty net. Erin Hetherington then made it three for the visitors when she went on a delightful run from midfield, which culminated when she was fouled just outside the edge of the 18-yard box. The Referee had no choice but to award a free kick. Hetherington stepped up and powered it home to give Bayswater a very satisfying scoreline. There is a old adage that says that the best defence comes from a strong offence. Generally, the idea is that strong offensive action will preoccupy the opposition and ultimately hinder its ability to mount an opposing counter attack, leading to a strategic advantage. In saying that, credit must be given to the Bayswater’s defence in Sheena Malcolm, Kerrie Corbett, Zoe Griffith, and Libby Clements who again proved they can perform when required and were too strong for the Subiaco forwards who found it difficult to create any clear cut chances. Bayswater City is now in second spot with a game in hand. Football West would like to acknowledge the great contribution to the game made by Ted Gray, who sadly passed away this week. Aside from being one of WA football’s most colourful characters, Ted also had a terrific impact on the game’s administration from the grassroots to the state pinnacle. After serving in the British Navy, where he started creating his famous, often corny, poems, he played for Cheshunt in what was then the London League and won a championship medal in 1949. His involvement in WA football began soon after he arrived in Perth when he formed Gosnells Soccer Club in 1969. After time as secretary of the Amateur Soccer Association, he commenced an extremely successful career as Executive Officer of the Soccer Federation of WA. He once proudly boasted that he was able to gain a major sponsor for every year he was in that role (1974-88). Ted and his wife Iris moved to New South Wales in 1997. He was inducted into the WA Football Hall of Fame (Hall of Recognition) in 2002. Football West is seeking an enthusiastic Digital and Social Media Coordinator to join the organisation’s communications team. Reporting to the Media, Communications and PR Manager, the successful applicant for this entry level position will be responsible for maintaining and monitoring Football West’s social and digital media platforms, including producing and uploading content and providing analytic web traffic reports. The Digital and Social Media Coordinator will collate and distribute Football West’s weekly e-newsletter, assist in the production of graphics and creative material for web and other publications and manage responsibilities associated with all digital requirements. To be successful, you will require an undergraduate degree in communications, marketing or a related multimedia discipline and have previous experience in digital and social media or website management. The position requires strong writing and editing skills. The ideal candidate will be highly motivated, organised and be able to plan and structure the working week in a fast-paced and dynamic environment. You must be able to work under pressure, meet regular deadlines and work around the requirements of the game and the organisation. The successful applicant will be required to work weekends and public holidays and must have a keen interest and understanding of local soccer. This is a unique opportunity to apply your digital, analytic and creative skills at an exciting time for the game and in a growing sports environment. Applications close on Monday, June 16. Only shortlisted candidates will be contacted. Become a Referee for free- as a female you can register for the Junior Referee course for free. How would you like to have the best seat in the house? Love football but can’t play as much as you did? Want a hobby where you can earn money, and enjoy yourself? 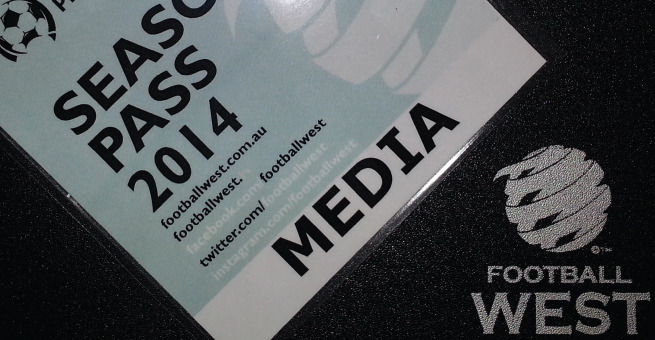 Football West is always on the lookout for more referees, as there as still many games going uncovered each weekend. Whether you just want to referee casually, or if you want to go all the way to the World Cup, WE NEED YOU! In order to become a referee with Football West, all candidates must first complete the free online FFA Laws of the Game (LOTG) Certificate. To access the site, please go to http://laws.myfootballclub.com.au and follow the instructions. This provides you with the basic introduction needed and gives you a better understanding of the laws of football. Even if you don’t want to become a referee, this free online course will help you explain why a free kick was given on the weekend. Upon completion of the LOTG Certificate, candidates can then apply for a Level 4 Junior Referee Course. This is the first official accreditation level for referees under the Australian Officiating Development Schedule, and successful candidates are then eligible to referee junior football matches. The course is run in a classroom-style format over one day. Candidates must be a minimum of 14 years of age on the day of the course, and have successfully completed the LOTG Certificate (proof of certificate required). The course cost is $75.00 per candidate. If you wish to register for a course, please send the completed form along with your Laws of the Game Certificate to Football West in order to secure your place. To ensure quality education, each course is limited to only 15 candidates on a first come first served basis. After completing the Level 4 Course, you will then need to register as an active referee with Football West. This will then officially recognise you as an accredited match official, and allow you to be appointed to matches. These details will be provided to you once you have completed the course. For more information, please contact Football West’s Referee Coordinator, Mathew Cheeseman, by emailing mathew.cheeseman@footballwest.com.au. Members of the football community and general public are invited to participate in a Home of Football workshop on June 11 at The Rise in Maylands. The workshop will allow attendees to provide input to the ongoing project and also understand the parameters of a Business Case being prepared by consultancy group, Davis Langdon. • clarify community and club priorities for the development. For catering purposes, registration is required and can be done by sending an email to Rachel Thorpe at rthorpe@davislangdon.com.au. Venue: The Rise, 28 Eighth Avenue, Maylands WA 6051. Click here to view information on getting to and parking at The Rise. Get ready to samba in the July school holidays with Football West’s Futsal Celebration. Select your futsal squad and we’ll assign your national team for an action-packed day of back-to-back games. The tight confines of the indoor arena will test your touch, improve your control and make you think as quickly as Cahill, Messi, Ronaldo and Rooney. If you’re not going to Brazil, why not cure your football fever at Football West’s Futsal Celebration? May proved to be a particularly jam-packed month for women’s football, with continental queens crowned in Asia and Europe, domestic titles decided and a new coach installed by USA. For all this and more, join FIFA.com in our customary look back at the main events in the female game. They might be world champions and Olympic silver medallists but, until last week, Japan had never won their own continental championship. That strange historical quirk was finally put right when, at the 14th attempt, the Nadeshiko finally got their hands on the AFC Women’s Asian Cup and led a group of five teams booking their place at next year’s FIFA Women’s World Cup™. A hard-fought 1-0 win over reigning champions Australia secured the trophy, with defender Azusa Iwashimizu – just as she had in the semi-final – emerging as the unlikely goalscoring hero. There were plenty of reasons to be cheerful elsewhere, too: the Matildas impressed with a youthful line-up, China PR raised morale by finished third, while Thailand qualified for the Women’s World Cup for the first time in their history, rounding off Asia’s quintet with Korea Republic. The search for a new USA coach came to an end on 16 May with the appointment of Jill Ellis, who had been in the post on an interim basis. The 47-year-old, who succeeds Tom Sermanni, is an experienced operator within the ranks of US Soccer, having coached at every age level and served as assistant in the squads that won gold at the 2008 and 2012 Olympics. Federation president Sunil Gulati cited Ellis’s “tremendous knowledge of our player pool and the qualities of multiple generations of players” as a key factor in the decision, and key US stars have been quick to voice their approval. The new coach’s first major test will come with a double-header against France on 14 and 19 June, followed by the CONCACAF qualifiers for the FIFA Women’s World Cup, which USA will host. Costa Rica and Guatemala qualified for October’s CONCACAF Women’s Championship earlier this week and, in doing so, kept alive their hopes of reaching the FIFA Women’s World Cup. The duo emerged triumphant from the UNCAF pre-qualifying event, with Las Ticas beating their Guatemalan hosts 3-0 in a final play-off to ensure they also claimed the event’s only berth at the 2015 Pan American Games. Preliminary matches also continue apace in Europe, where Germany, England, Spain, France and Switzerland are all closing in on automatic qualification. Norway, meanwhile, face a battle with the Netherlands, who saw off Belgium, while arguably the most intriguing contest involves the unbeaten duo of Scotland and Sweden in Group 4. The official slogan for the FIFA Women’s World Cup Canada 2015 – ‘TO A GREATER GOAL’ – was revealed in Winnipeg on 8 May, and the backdrop could hardly have been more fitting. After all, the unveiling was done during a match between Canada and USA that attracted a hugely impressive crowd of 28,255. Only once before in Canada has a bigger attendance been recorded for a women’s friendly, and the fans who turned out were treated to an enthralling encounter. Canada had seemed set for victory thanks to a first-half header from 18-year-old Kadeisha Buchanan, but USA’s Vancouver-born star Sydney Leroux equalised with 12 minutes remaining to ensure a 1-1 draw. The result preserved the Stars and Stripes’ 30-match unbeaten run against their northern rivals, a streak that dates back to 2001. It was described as the greatest final in the history of the UEFA Women’s Champions League, and it ended with Wolfsburg having retained their crown. Ralf Kellerman’s side became the first German team to win the trophy in successive seasons, but they did it the hard way, coming from 2-0 down at half-time to beat Tyreso 4-3. And while Marta, who scored twice, looked back to her best for the Swedes, it was Wolfsburg’s Martina Muller who stole the show with a double of her own – including an 80th-minute winner. Lyon, who lost to Wolfsburg in last year’s Champions League final, made it eight titles in a row in France after securing their latest championship with a game to spare. Despite a determined challenge from Paris Saint-Germain, who seem sure to offer a genuine threat to the serial champions in years to come, Patrice Lair’s side were able to cross the finishing line thanks to an emphatic 5-1 win over Guingamp. France‘s big two will, however, do battle again when they meet in next week’s French Cup final to compete for the final silverware of the season. While Lyon maintained their supremacy in France, Italian side Torres missed out on a chance to extend their run of consecutive titles to five. Their fate was sealed when they went head-to-head with title challengers Brescia on the final day of the Serie A season, knowing that only a win would be enough retain the trophy. Brescia, though, proved worthy winners, triumphing 2-1 thanks to goals from Martina Rosucci and Elena Linari, the latter an injury-time penalty. Patrizia Panico scored Torres’ consolation and ended the season on 42 for the season – enough to secure the 39-year-old 13th Capocannoniere crown as the league’s top scorer. 40 – The new all-time Australia scoring record, which belongs to Kate Gill after the 29-year-old surpassed Matildas legend Cheryl Salisbury’s 38-goal mark with a double in her team’s 3-1 Asian Cup victory over Jordan. Do you know the new Glory A League Goalkeeper Coach? Perth Glory Football Club is pleased to confirm the appointment of Danny Milosevic as the Club’s new Goalkeeping Coach ahead of the 2014/15 Hyundai A-League season on an initial 2 year contract. Milosevic joins Perth Glory having just completed his role as goalkeeper coach to the Australian National Women’s team with Football Federation Australia, at the recent AFC Women’s Asia Cup in Vietnam. After making his professional debut with the Canberra Cosmos in 1995 in the National Soccer League, Milosevic went on to captain the Australian Under 20 side in the World Youth Cup in 1997 as well as playing in the German Bundesliga. In 1998, Milosevic joined Perth Glory, as one of a number of high profile signings under then Head Coach, Bernd Stange. Milosevic went on to play 27 games in just one season for Perth Glory before being transferred to English Premier League side Leeds United, where he spent 5 years, as understudy to England international goalkeepers, Nigel Martyn and Paul Robinson, and figuring strongly in their Champions League plans. Milosevic went on to join Scottish Premier League side Celtic FC in 2004 before returning to the Hyundai A-League in 2005 with the New Zealand Knights. “It’s a terrific signing for the Club. It demonstrates our commitment to strengthen our coaching staff ahead of the 2014-15 Hyundai A-League season.” CEO Jason Brewer said today. Danny will commence in his role as Goalkeeping Coach when the Perth Glory team return to pre-season training in mid-June. Comments Off on Do you know the new Glory A League Goalkeeper Coach? 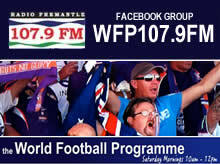 Penny Tanner hosts another two hours of football news on 107.9fm from 10am Saturday. Tim Hodgson from one of most successful women’s only clubs, Northern Redbacks, talks building facilities and programmes. Mandurah City President Peter Rowe considers the effect of NPL on NPL clubs, the FFA Cup and how football is moving on in our lower southern burbs. Former Socceroo Captain Paul Wade talks up our emerging style and why our Socceroos are worth every Penny. Mitch Grima from the roar.com.au analyses the World Cup groups and international friendlies that are tantalising us with talent. Text your comments to 0408921832 or post it to our Facebook page. Radio Fremantle. Community Radio. Celebrating 25 years on air in 2012.